The Ricoh GXR system comes in two parts. The body houses the controls, the viewing system, the battery and the memory card. The interchangeable camera unit contains the sensor and the processing hardware. The idea is that you swap camera units according to the type of job you're doing, and the Ricoh has two to choose from straight out of the box, including an A12 50mm f/2.5 Macro fixed focal length unit and the S10 24‑72mm f/2.5-4.4 VC unit, which we've tested here. All clear? Now this is where it gets confusing. These camera units have different sized sensors. The 24-72mm unit has a 1/1.7-inch sensor while the 50mm unit offers an APS-C‑sized sensor. This makes the GXR harder to categorise and judge. Is it a compact camera with an SLR-sized sensor? Sometimes. Or is it an expensive and slightly complicated compact? Again, sometimes. Of the two units currently available, the 50mm Macro unit is arguably the more exciting in that it uses a larger APS-C-sized sensor. It wasn't available for review, but our hands-on test suggested bigger sensors are surely the future (if there is one) for the GXR. Meanwhile, a recent Ricoh presentation has hinted at a third camera unit, boasting a high-speed CMOS sensor and what looks like a telephoto lens. Most importantly, once the body and chosen unit are slotted together, the GXR feels like a 'proper' camera. You immediately forget that it's made up of two parts, because the fit is perfect. It's barely bigger than Ricoh's other compacts, and significantly smaller than the Olympus E-P1 or Panasonic GF1 – a fact that could prove very significant later on if we see some more larger sensor camera units arrive. Apart from the unique design, two things stand out with the GXR: its build quality and its controls. There are some very good high-end compacts around right now, including the Canon G11 and S90 and the Panasonic Lumix LX3, but the GXR is in another league. The controls are firm, tight and precise, and the layout is excellent. A small but perfectly weighted control dial on the front takes care of a dozen different adjustments, depending on the context, while a rotary controller on the back operates as both a button and a dial for quickly setting ISO, white balance, quality or any number of other functions – it's completely customisable, as are the two separate function buttons on the back. Plus, if you're still not happy, you can use a direct interface button to produce an on-screen overlay that you can navigate with the directional buttons. The GXR has a spectacularly good three-inch 920,000-pixel LCD screen, but if you prefer you can connect an optional electronic viewfinder (EVF) to the accessory shoe. This also has 920,000 pixels, and it swivels up to 90° for waist level shots or tricky macros. This camera unit focuses right down to 1cm, and while the minimum focus does change when you zoom, it's only a little, increasing to around 3cm. The macro capabilities, then, are exceptional – which does rather undermine Ricoh's separate 50mm macro camera unit, although that does have the larger sensor and could double as both a portrait and short telephoto lens. But what about the pictures? The 24-72mm zoom has very good edge-to-edge sharpness and not much distortion (the camera can correct distortion internally too), and the exposure and white balance systems are up to the same high standard. However, there's a limit to what any 1/1.7-inch sensor can do, and both noise and noise reduction start to creep in as early as ISO200-400. This camera unit does go all the way up to ISO3200, but the small sensor means that the quality's on the slide well before you get that far. 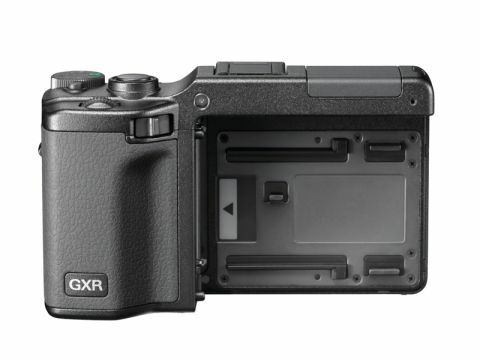 If Ricoh doesn't come up with more camera units, and soon, the GXR may remain just an expensive oddity. However, if a wider selection of camera units follow, especially with APS-C sensors, this camera could turn into a modern classic. Watch this space.